Suken Anisaria is just starting out as a bounty hunter in a floating city riddled with crime, corruption and magical convergences powering everything from rail-cars to crossbow bolts. He’s got years of training under his belt, a hatful of his dead uncle’s debts to pay off, and the talent and drive to make it in the dangerous world of bounty hunting. When a warrant goes up for a notorious thief-turned-murderer, he jumps on the chance to take it, knowing that success will cut years off of his career advancement. Hunting’s never easy, but this warrant’s harder than most. 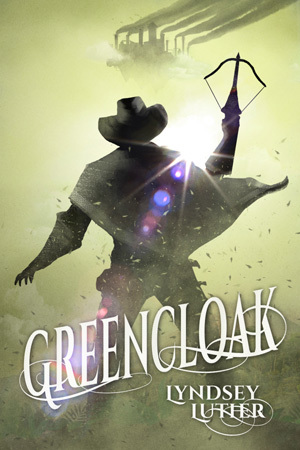 The thief the broadsheets named “Greencloak” is rumored to be a master of disguise and is infamously solitary, making it damn near impossible to find leads on him. But Suken’s got a few contacts that give him an edge on the competition. He’s certain that he’s got this case in the bag… but the whole job goes sour when he learns that Greencloak is being framed. With an assassin shadowing his every step, a shady underground organization determined to stop him from bringing the truth to light, and the guards convinced that he’s complicit in the crime, Suken’s only remaining option is the most drastic one – teaming up with the notorious thief in a last-ditch attempt to clear both of their names.